Smart Cities are currently a hot topic. Digital technologies offer new, groundbreaking opportunities to ensure public well-being, preserve the environment and boost growth in the business sector. But how can we facilitate Smart City projects that achieve this huge potential? Read how you can create results through digitalisation. Get the report for free here. Smart mobility can improve existing transport infrastructure. Read here about successful initiatives. Read about the ambitions in Copenhagen, and how they can make the city smarter. In a world facing challenges such as urbanisation, resource scarcity, and climate change, the need for sustainable urban development and planning grows ever greater. 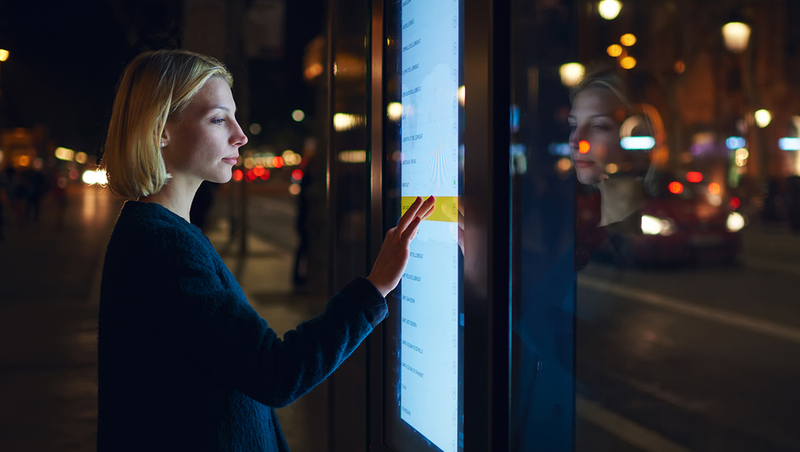 Ramboll believes Smart Cities are a key way to change the way citizens and businesses use cities and towns, and thus to advance the green agenda and make urban life easier. When talking about Smart Cities, looking towards Denmark might be a good idea. In a Danish context, the Smart City concept has drawn much attention and plays a growing part in state, regional and local strategies and plans. The Digital Economy and Social Index 2017 has identified Denmark as Europe’s most digitally advanced country, which gives Denmark the overall conditions to make Smart City a success. In Ramboll’s recent publication It in Practice we present a so-called Digital Readiness Index that benchmarks industries and summarises organisations’ digital readiness. Our index clearly shows a significant difference in the ability to realise the huge digital potential. Some Danish organisations are well-prepared for the digital future, while others are far from going digital. But even for digital laggards the good news is that digital readiness is only one parameter within smart city – a lot hinges on the strategic considerations, collaborations, and decisions made long before we start talking technology. We believe urban decision-makers should consider a range of critical steps on the road to successful Smart Cities. Any organisation wanting to work with Smart City solutions must base its efforts directly on its organisational strategy. This will ensure that the desired benefits are deeply rooted in and contribute to the strategic objectives. It is also essential that Smart City projects focus on a well-defined urban problem area. In a Smart City context, the problem areas will often span more than one sphere of responsibility, thus requiring creation of cross-organisational public partnerships. This makes it possible to formulate potential initiatives together as a joint effort with other public sector players. All this before talking strategy. Though this may seem obvious, we have discovered that some organisations interested in launching a Smart City project start planning initiatives without first considering strategy, problems and areas of responsibility. This can be a highly risky approach, because it can lead to projects that fail to create value because they lack an underlying strategy. 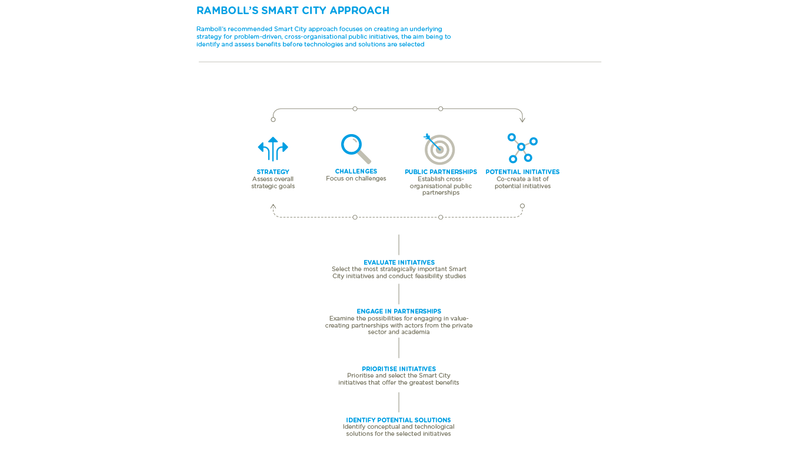 At Ramboll we recommend that organisations interested in Smart City initiatives clearly identify the public sector players involved, define the problem areas and assess the strategic ownership. Based on the potential initiatives, the ones considered most strategically important to the organisations should undergo a feasibility study. The aim of the study is to examine the socio-economic effects that each initiative is expected to achieve. Identifying relevant partnerships with players from the private sector and academia can ensure that value-creating synergies are exploited. These partnerships can provide knowledge and experience, and may also cover financing, operations, and maintenance of the end-product of a Smart City initiative. As the last step on the road to a successful Smart City, all the partners involved will use business cases to evaluate and identify conceptual and technological solutions. The evaluation may include qualitative, socio-economic benefits as well as quantitative, operational benefits. The Smart City partners then select and prioritise the best initiatives, after which the development, pilot testing and implementation can begin, with clear parameters set for the benefits to be achieved. The continued work with the Smart City initiatives must at some point include relevant groups of citizens to make sure vital inputs are picked up. Ramboll’s experience is that input from the citizens are important to ensure planning and development processes that actually meet their needs and wishes. After all, smart cities are about making the cities better for the people living there. Based on the feasibility study, business cases and the inputs from the citizens, organisations can now begin identifying digital solutions with well-defined and realisable benefits. It can be tempting to jump straight to scrutinizing the many digital opportunities already out there. However, by not giving in to this initial desire, cities multiply the chances of success in the long run as the end game is not a technologically advance city per see but a truly smart city. For this to happen you need to be smart about every stage of the process.